Janhvi Kapoor is all set to debut in Bollywood come July and in her first ever interview with Vogue magazine, Janhvi talked about the last day she spent with her mother Sridevi and what she said about Dhadak after watching 25 minutes of footage of her debut film. Janhvi was interviewed by her Dhadak producer and industry mentor Karan Johar. She told him: "The day before she left for the wedding (Mohit Marwah's wedding in UAE), I had to shoot, but I couldn't sleep, so I was like, 'I need you to come and put me to sleep.' But she was packing, so by the time she came to me I was half asleep. But I could feel her patting my head." Janhvi skipped the wedding in February as she was filming Dhadak. When Karan Johar told Janhvi he gets "extremely emotional" when he sees that "after her passing the family has actually come together," Janhvi added: "It's made us feel safe and secure. I think, even for Papa, it's a source of comfort. It's definitely tied us together. We've lost mom and I don't think that's a loss any of us will ever get over." Last year, Sridevi said that her younger daughter Khushi is capable of taking care of herself and it's Janhvi who needs her attention. 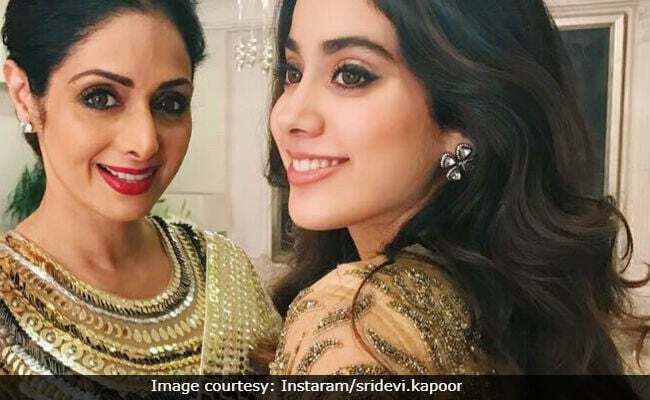 Janhvi corroborated her mother's statement and told Karan Johar that after Sridevi, it is Khushi who looks after her instead of the other way around. "Khushi is very maternal with me. I am a full baby. She takes care of me. Now she comes and puts me to sleep sometimes," Janhvi told Karan Johar. Talking about Sridevi's opinion of her film Dhadak, Janhvi told Karan Johar: "She was very technical about it. The first thing she told me was the things I needed to improve - she felt the mascara was smudged and it really bothered her. The second half has to be different, she told me, 'You can't wear anything on your face.' That's all she told me but she was happy." Last year, Sridevi had also said that she did not want Janhvi to make a career in acting, of which, Janhvi told Karan: "She never wanted me to be an actress... She was more relaxed about Khushi (Janhvi's younger sister) getting into films. She thought I was naive, that I wasn't thick-skinned enough. She wanted us to live a more relaxed life. She loved what she did but you know it was intense." Janhvi told Karan Johar she wants to make her parents proud of her work. "I'm so proud of my parents. I need to make them as proud of me." Earlier this month, Janhvi along with Khushi and Boney Kapoor collected Sridevi's National Award at an event in New Delhi. Sridevi won the Best Actress award posthumously for her role in MOM. Sridevi died on February 22 by accidently drowning in the bathtub of a hotel room she was staying in Dubai. She was brought to Mumbai three days later and cremated with state honours.